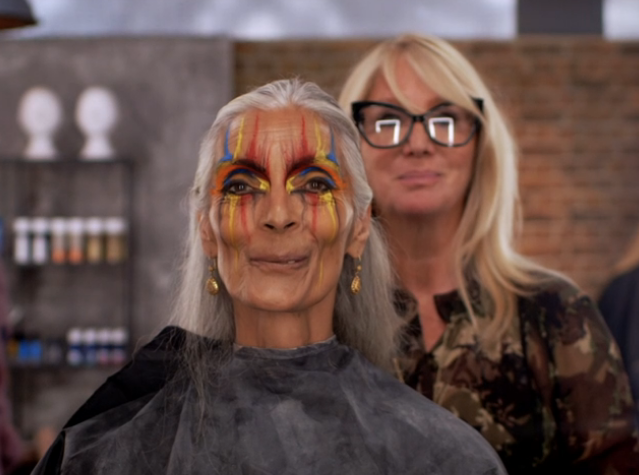 Episode 6 of Glow Up was all about make-up for fashion shows. The 5 remaining MUA’s hit London Fashion Week to work on their biggest issue – timing. Backstage at fashion shows is a manic environment where make-up artists are under serious pressure to create looks. This week’s guest judge, Lan Nguyen-Grealis, is a make-up artist who has gained a reputation for her daring and creative looks across editorial, celebrity and fashion. She’s been the key designer for countless fashion week shows and is taking on the final five contestants to be her team for one of the shows. This episode does not disappoint with one of the most gripping creative challenges at the end, where the judges clash over the opinions on Ellis’s work (we absolutely loved it). But first, London Fashion Week – as we know, fashion week is gruelling for the most talented of make-up artists as your model can be late, hair can hog her, manicurists get in the way and you have no room to work. But you don’t have one model, you have many and the show is about to start! Ok slight exaggeration but many artists will attest to this situation happening once or twice in their career. Lan shows the team her make-up design of bold colourful eyes, a strong liner and a lip. In any other environment this make-up would seem jarring, even a little theatrical, but on the catwalk, anything goes and must be seen from the audience. It was lovely to watch the contestants really get into this professional challenge where they all managed to impress and deliver. We recoiled in horror when Leigh presented his make-up to Lan with lipstick flecked (accidentally) all over the cheeks. She spotted this immediately and he fixed it, but these moments can cost you time backstage. Timing was the lesson learnt on all challenges, and no more than this task at London Fashion Week. We were pleased to see Ellis come into his own as he enjoyed the bold, bright make-up style. Lan described Bethany as the “dark horse” – it is never a bad thing to go undetected yet get the job done. Many people in the industry value low-key make-up artist personalities. The second challenge was to follow a creative brief for a fashion collection. As mentioned, we loved Ellis’s use of colour and flame-like design, working harmoniously with the mature model’s characterful face. Val loved it too but Lan and Dominic were not taken by the make-up. This challenge highlighted the importance of working to a brief, and how badly Jasmine’s work was received when she went against this brief, choosing to interpret a sweaty, bruised skateboarder, as a glowing, rosy beauty make-up. Fortunately she pulled it together in the face-off challenge.